I’m a pianist as well as a guitarist and I have an old Kranich and Bach baby Grand Piano. I’ve had my piano tuned professionally only once since I’ve had it and naturally, over time it has gone out of tune. So I decided to tackle the job myself to see how well I could tune my own piano. It wasn’t as hard as I thought it would be and the results have been very good. You can purchase a basic piano tuning kit that includes the tuning hammer, felt temperament strip and an assortment of rubber mutes. I also purchased a book to help get me started tuning my piano. The book I got is called Piano Tuning: A Simple and Accurate Method for Amateurs by J. Cree Fischer. This book gives you a very good overview of how your piano is constructed, how your piano works and how to tune your piano. The book is very easy to read and you don’t have to read the entire book cover to cover to be able to tune your piano. You can simply use the book as a reference and read the chapters that are relevant to what you need to do to tune your piano. Finally you will need a tuning reference for setting the pitch. Simply by using a tuning fork you can use the guide in the book to tune your piano by ear. I have a very good ear but tuning a piano by ear can be a daunting task. It is a skill that can take years to perfect. That’s why I used my trusty Peterson Strobe Tuner instead of a tuning fork. The tuner I have is the Peterson 490-ST AutoStrobe tuner which is extremely accurate. It is pre-programmed with several piano specific stretch tunings. These stretch tunings will help you set the temperament on your piano making the rest of the tuning process much, much easier. The Peterson AutoStrobe tuner is an essential tool for tuning your own piano. It’s fairly expensive but it will easily pay for itself in savings when you tune your own piano. 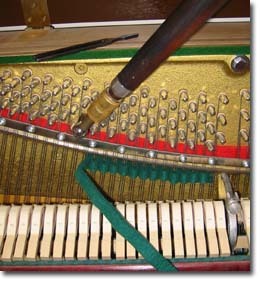 So there you have it, all the tools you need to tune your own piano are in the links below. Peterson 490-ST AutoStrobe Tuner with Stretch Tuning The Peterson 490ST AutoStrobe Tuner with Stretch Tuning allows automatic (handsfree) note selection for fast, accurate tuning of instruments for students, technicians, and musicians at all levels. This feature also permits realtime display of intonation to improve performance and listening skills while playing. Includes stretch tuning capabilities for enhanced tuning of stringed or percussive instruments such as the piano, bass, guitar, marimba, steel pan, and others. John, readers can also buy your book in the U.S. from Amazon.